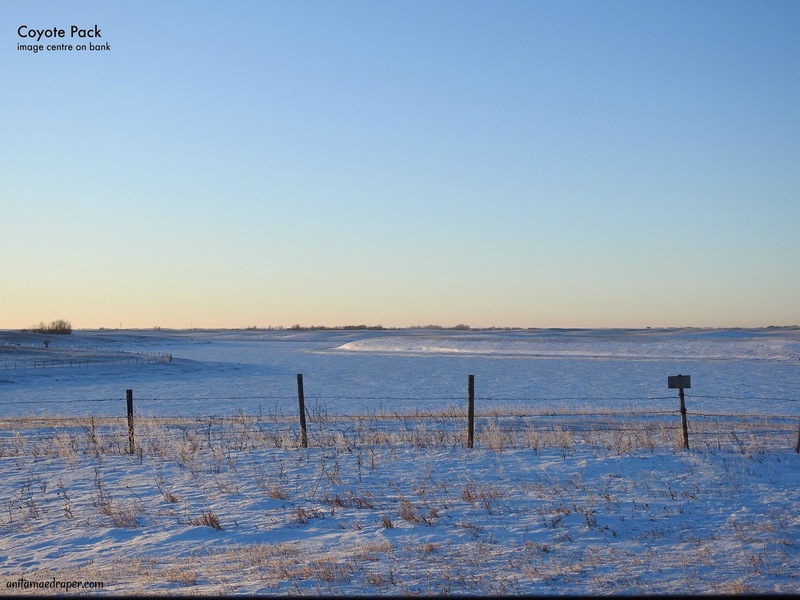 The year 2018 started off with bitter temperatures where everything on the prairies tucked down tight except for browsing wildlife and people with things to do and places to go. 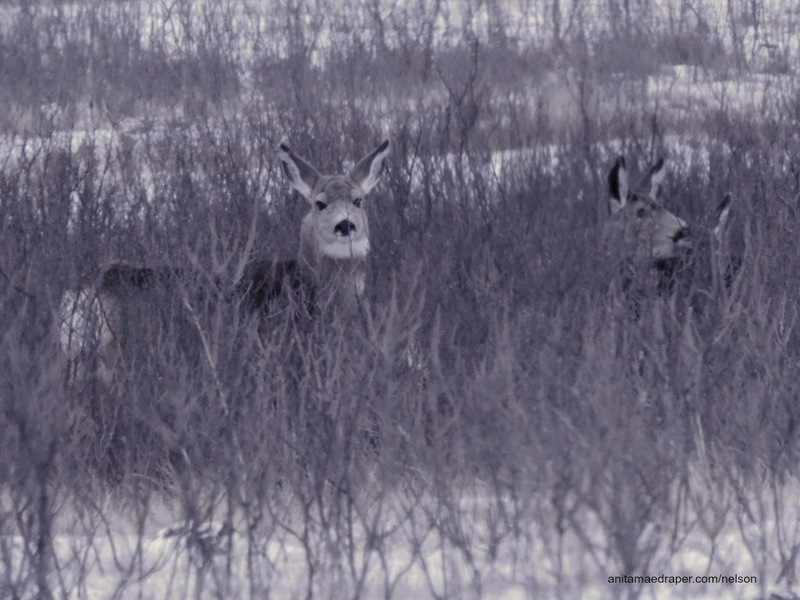 Nelson was the first of the family to spot something other than birds when he caught sight of these Mule Deer trying to hide in some brush on January 2nd. 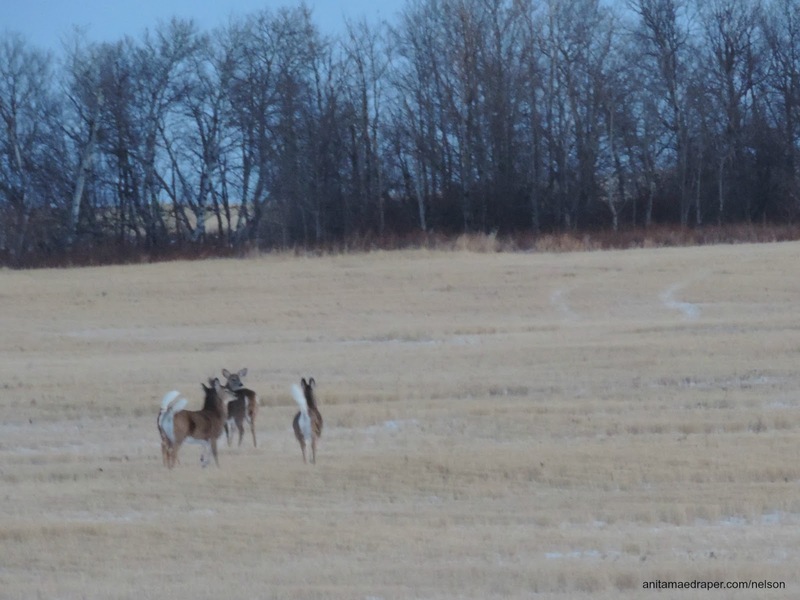 On January 7th, Nelson saw the white flash of White-tailed Deer bounding across a stubble field and stopped to get this shot. As posted in Bird Watch January, I was only spotting my usual sparrows, redpolls, and chickadees that stayed the winter at home and it wasn't until I headed to town on January 9 that I saw 2 ravens and a Great Horned Owl. Not only did I see the owl on my way back to Draper's Acres, but I also saw this Mule Deer hiding behind a slough in the middle of a stubble field. We tried taking pics of the moose through the windows without any success, so out of desperation, I squeaked open the front door and ducked my head and camera out into the bitter cold. Nary a sight of it. "Where is it?" I stage-whispered over to Nelson. "Right there, by the tree," he answered from the kitchen. I stepped out and aimed my camera at the still-lit Christmas tree, but couldn't see anything beyond it except tracks in the snow. Since Nels could no longer see it either, we locked up for the night and went to replay the security camera footage. It looks confused, doesn't it? 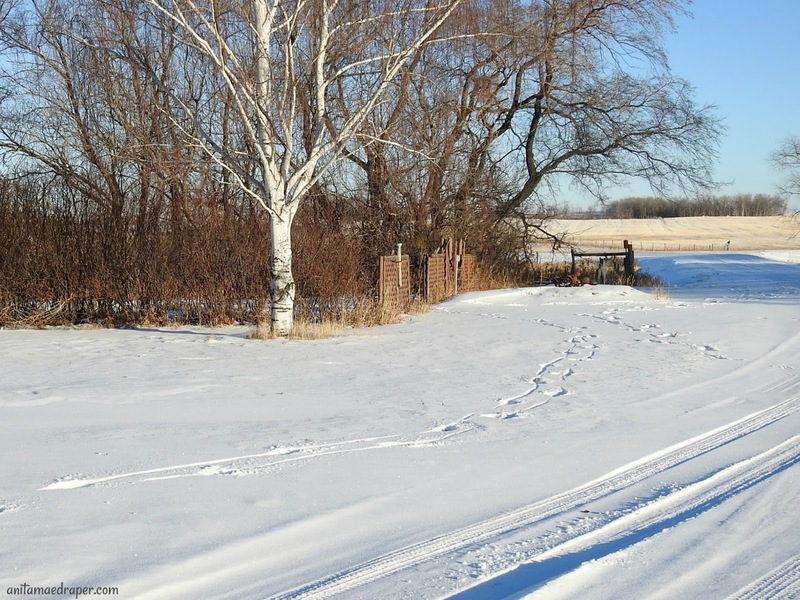 The next morning I went out for my usual photo foray and immortalized the moose tracks before they got covered by more snow or even melted away. That was January 12th and later that day as I headed back to the farm after dropping off some parcels at the post office, I took a route further to the west. I don't often go this way in the winter because it involves a couple of steep valleys and I'm unfamiliar with how they react to snow drifts and ice. But it hadn't snowed in several days, a weird January thaw was on its way, and I wanted to see what was out there. I didn't see anything driving through the first smaller valley, and I didn't think there was anything while driving through the second valley, either, but as I drove up the side, I spotted movement to the right at the corner of my eye. With the impression that I'd seen a deer, I climaxed the ridge and then turned around at the next approach. 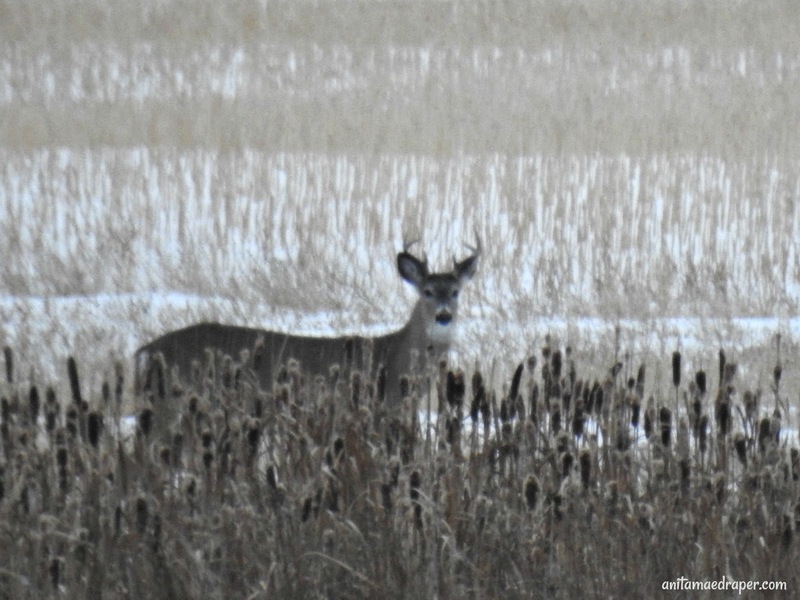 I drove back down the into the valley, confirming the presence of several deer on the west side of the hill, as well as several more at the bottom. Apparently, they'd waited until I passed before coming out of hiding. Wanting to take pics in a safe area, I continued through and up to the top of the other side where I could safely turn around. I then drove back down to the valley bottom where I pulled over onto the shoulder. 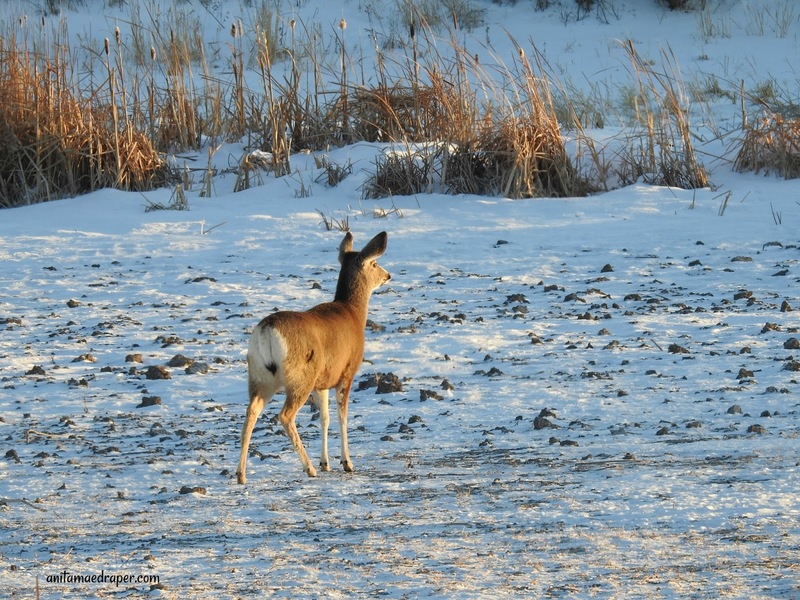 Surprisingly, 3 deer stayed on the east side of the road where they searched for food on the frozen bottom of the dried slough. The image you see here is one of the three, clearly showing that it's a Mule Deer from the size of its ears and the colour of its tail. To the west beside a large body of water were more deer trying to hide in some scrub brush that was sparse enough to show parts of them, yet thick enough to keep me from getting a good shot. Between them and me was a Game Preserve sign that stated no hunting was permitted, which could explain why they weren't all running away. The last time I was in the area shore birds caught my attention, so between the birds and the deer, I'll check back this way again. With sunset approaching, I headed out of the valley, stopping only to photograph the Mule Deer that had first caught my eye. 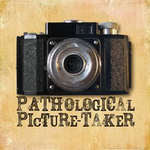 Can you see them in this next photo? I thought that was the end of my blessings for the day, yet as I drove on with my head moving left to right to catch any movement, I spotted several dark objects on the shore of another frozen body of water. Under the colourful rays of a the setting sun, I pulled off the road onto an approach and scrutinized the landscape to the west. 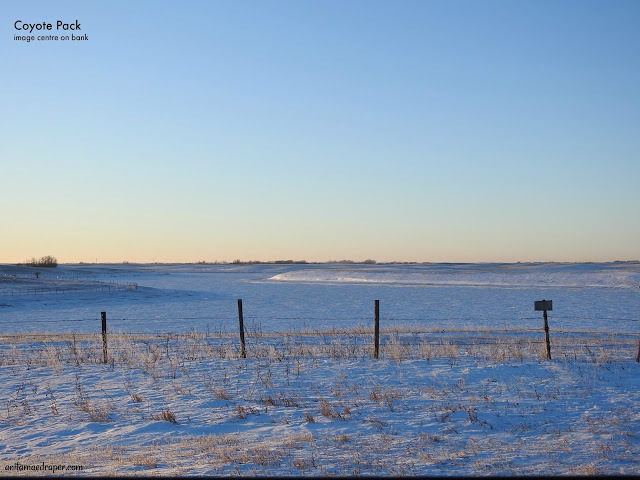 Do you see the white snow bank in the middle of the image? That's where I saw dark spots and out here on the prairies, a dark spot on the snow is a good indication of wildlife. So I pulled out my camera and zoomed in, thinking I'd see large rocks or something. Instead I found a coyote pack. 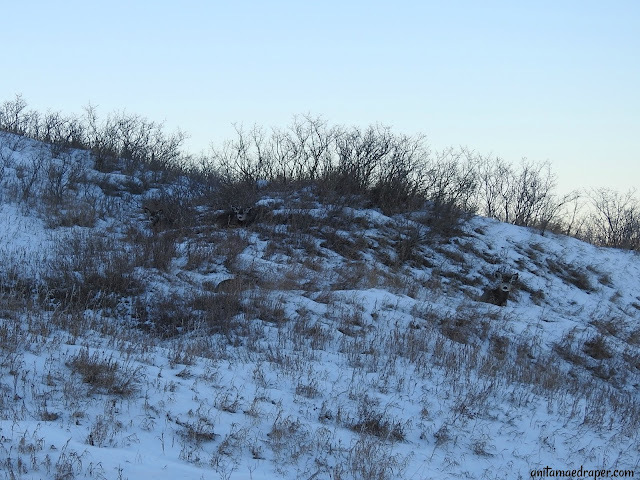 There were 4 coyotes in total, but only three would fit in my long-range shot. Any closer and the image gets blocky. 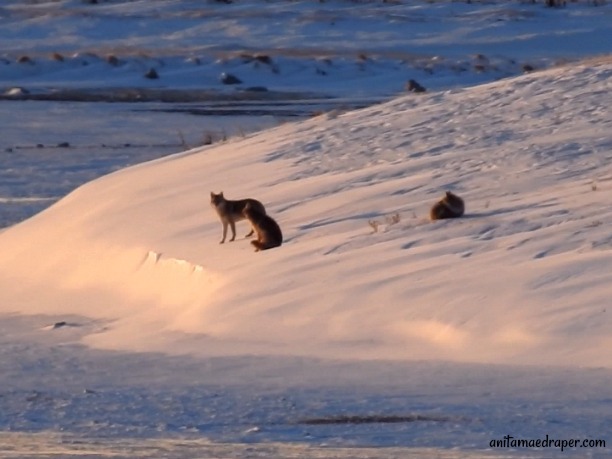 One coyote left the pack and headed across the ice, while the other coyotes tucked their heads into their legs and looked like the rocks I first imagined. It was time to move on. 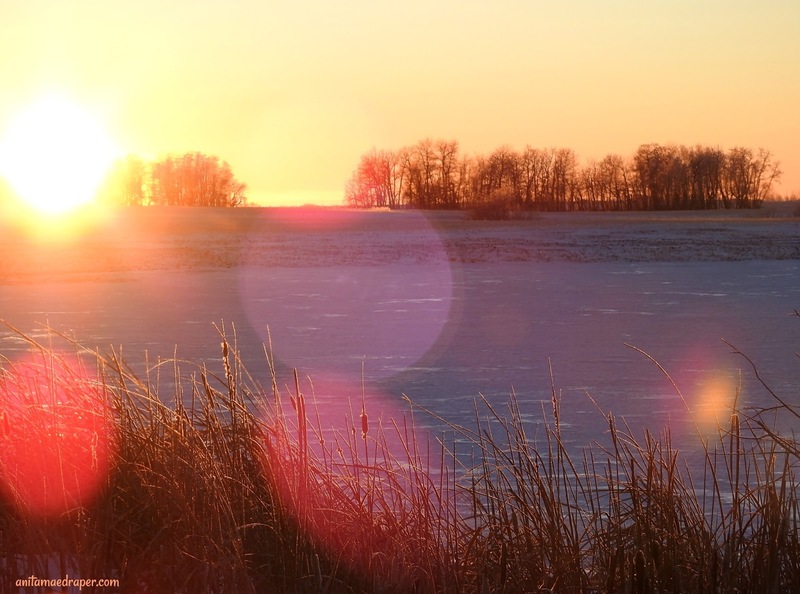 I took a bunch of sunset pics as I drove home, each one showing bokeh spots from the dust, ice crystals and whatnot attained from driving down prairie roads with an open window in the middle of January. I'll end our January Wildlife Watch with a video Nelson took on the way to church on January 28th. 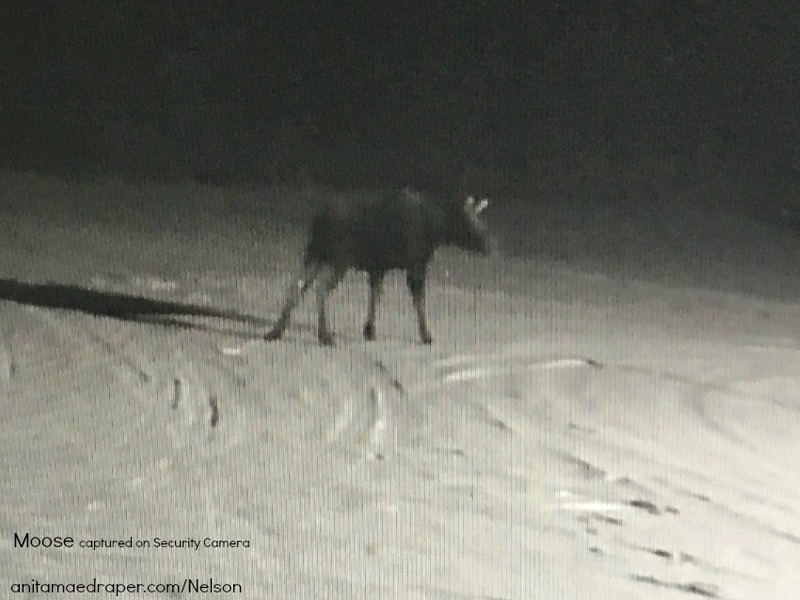 Although JJ also took video of the same moose with his phone, the quality was inferior with blocky images compared to what you see here. Please remember this was taken with with a cell phone and not our usual cameras. Sorry if the video of the moose didn't work for you. Sometimes it does and others...shrug.